Fungi are composed of microscopic, tube-like structures called hyphae (singular hypha) which grow on substrates such as leaf litter, fallen timber and herbivore dung. The hypha has the shape of a cylindrical tube of even diameter with a tapering tip that branches subapically, with each branch having a tip of its own. By iteration of this modular unit comprising of a tip and a subapical branch (Figure 1.1), a radiating system of hypha called the mycelium is formed (Carlile, 1995). At places, hyphae become interconnected by short lateral outgrowths, bringing the entire mycelium into a protoplasmic continuity. The mycelium spreads over and penetrates into the substratum, secreting digestive enzymes which decompose the polymeric constituents of the substratum and absorbing the solubilized carbon and nitrogen and the phosphorus, potassium and sulfur compounds for its growth. This mode of fungal growth is inferred from observations of fungi growing in nature and by examination of cultures grown on nutrient medium solidified with agar (Figure 1.2). being that if the mycelial growth intermingled to form a continuous mat it would indicate that the isolates were genetically related, i.e., they belonged to an individual fungus. On the other hand, if the isolates showed a zone of aversion, i.e., an area between the paired mycelia not penetrated by hyphae (an incompatible reaction), it would indicate that they were genetically unrelated. Surprisingly, the results indicated that even though the subterranean mycelium of A. bulbosa may no longer have a continuous boundary due to the its fragmentation, the mycelial isolates belonged to an individual fungus (Figure 1.4). Figure 1.2 A two-day old Neurospora colony grown from a small amount of mycelium placed on the center of an agar medium in a petri dish. Figure 1.3 Hyphal strategy of attacking forest trees. From Ingold and Hudson, The Biology of Fungi (1993), Chapman and Hall, London. With permission of Kluwer Academic Publishers. Figure 1.4 Diagram of stages in development of an individual colony of a fungus. (a) A germinating spore (black dot) that has produced a short hypha. (b) Branching to form a radially expanding mycelium. 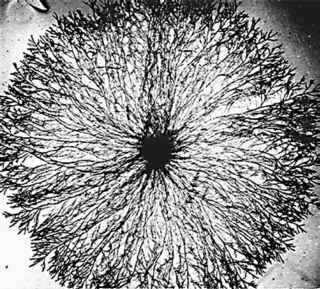 (c) An interconnected hyphal network formed by fusion of hyphae. (d) Disconnected mycelium of an individual fungal colony. of DNA fragments compared. The finding was that DNA fingerprints of fungal isolates from an extensive area were identical. 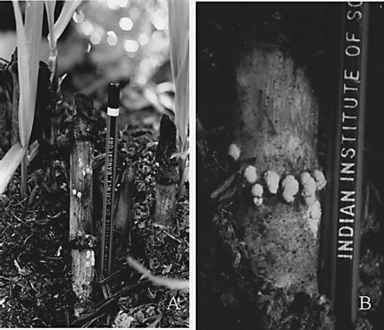 It was inferred that all isolates sampled from an area approximately 15 hectares belonged to the same individual fungus. Having ascertained the individuality of this giant fungus colony, the question arose of determining its total mass. From the average weight of the rhizomorph and their numbers in a representative area of the forest soil, it was estimated that this colony of A. bulbosa contained at least 10,000 kg of biomass. Furthermore, from the growth rate of the fungus on wooden stakes buried in the soil as well as on nutrient medium, the age of the fungal colony was estimated to be around 1500 years and this large and aged living organism may still be growing. Although less publicized, a clone of A. ostoyae discovered in Oregon has a mycelium spread over 890 hectares and is 2400 years old (http://www.anbg.gov.au/fungi/mycelium.html). Since hyphae are capable of potentially unlimited growth, fungi are regarded as immortal organisms. For a fungal hypha, life is at its tip. Early in the last century, measurements over a period of the distance between the hyphal tip and the first septum (Figure 1.1) and distances between the successive segments showed that while the former increased the latter remained constant, thereby demonstrating that the growth of hypha is confined to the tip. When 14C-labeled N-acetylglucosamine, a radioactive precursor of chitin—a structural component of the fungal cell wall—was fed to a growing mycelium and its site of incorporation in hyphae was determined by autoradiographic imaging of the whole mycelium, the incorporation of the label was observed only in the terminal region of the hypha. This observation confirmed that a very small terminal region (less than 100 ^m) is the growing region of the hypha (Wösten et al., 1991). Cell wall and even organelles in the distal region of the hypha may be broken down by controlled autolysis and the solubilized nutrients translocated to the growing tip for addition into the cell membrane and cell wall at the tip and perpetuation of its growth. The strategy of fungal growth is to keep the tip extending by the active forward movement of the protoplasm. The hallmark of hypha is its growth in one direction only, i.e., its growth is polarized. However, the mechanism by which the protoplasm is drawn toward the tip, leaving an empty tube behind, remains a mystery. Since the directionality of growth is established at the hyphal tip, this is the likely place where clues to polarized growth of hypha could be found. A variety of approaches are being used: electron microscopy; video-enhanced microscopy of movement of green fluorescent protein (GFP)-tagged organelles in living hypha; fluorescence imaging of distribution of ions; micro-electrode measurement of pH along hypha; patch-clamp detection of ion channels; immunofluorescence detection of enzyme distribution; and measurement of turgor by the plasmolysis method. However, there is no understanding as yet of how the growth of hypha is polarized but some of the pertinent findings are given below. Figure 1.5 Diagram of a longitudinal section of hypha. Adapted from Ingold and Hudson (1993). Figure 1.6 Video-imaging of Spitzenkörper trajectory in hypha. Tracings from photographs of Trichoderma viride taken during 9 min interval (Bartnicki-Garcia, 2002). wall synthesis, allowing their localized delivery and polarized growth of the hypha (Bartnicki-Garcia, 2002). Once the Spitzenkörper has discharged its contents, a new Spitzenkörper is reformed. The cycle of collection and discharge of vesicles is consistent with the observation that growth of fungal hypha occurs in pulses (Lopez-Franco et al., 1994). The association of the Spitzenkörper with a meshwork of microtubules and microfilaments suggests that its polarized trajectory is determined by the growing scaffolding of microtubules. Supporting this is the observation that benomyl, an inhibitor of microtubule assembly, markedly disturbed the directionality of hyphal growth of wild-type Neurospora crassa whereas a benomyl-resistant mutant was not affected. The evidence for collection and discharge of vesicles containing membrane and cell wall precursors by the Spitzenkörper is circumstantial. However, their polarized delivery and insertion into the plasma membrane at the tip could explain the generation of hyphal shape and polarity of the hypha. The vesicle membrane and plasma membrane at the tip may have specific proteins which tether the communicating membranes very close for docking and driving their fusion as postulated in animal cells (Rothman, 1994). At the core of pairing between the fusions of vesicle with its target membranes lies an interaction between homologous vesicle and target membrane proteins called v- and t-SNARES. Using specific-antibodies, a tip-high gradient of t-SNARES in Neurospora hypha has been demonstrated (Gupta and Heath, 2002). The location of Spitzenkörper at the tip and of tip-high gradient of SNAREs may together bolster rapid apical growth of the tip. chelators, suggesting that the tip-high gradient of free calcium is required for tip growth due to an unknown mechanism. Hyphae are generally 5 to 10 ^m in diameter. This implies that a hypha has a large surface area in relation to the total mass of protoplasm. The large surface area of hypha maximizes its contact with environment for uptake of raw materials for biosynthesis, for gas exchange and for the release of by-products of metabolism. A large surface area is advantageous in other ways, too. For example, sugars and metabolizing enzymes are stored in the space between the plasma membrane and the cell wall (intramural space), which the hypha can apparently use as the energy and carbon source during exploration of the surrounding area for nutrients. This strategy is manifest in the high respiratory rate of mycelium in the absence of exogenously supplied respiratory substrate (endogenous respiration)—a feature that undoubtedly contributes to tolerance to adverse conditions for extended periods. The large surface area of the hypha is not without its disadvantages. Because of the single-cell thickness of the hypha, the environment has a direct effect on it, rendering the thin-walled hypha vulnerable to desiccation. 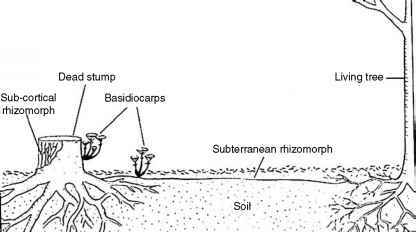 Fungi, therefore, must grow either in aqueous media or in a very humid atmosphere. In adverse conditions, the tip perceives a signal and apparently produces a conidiation-inducing factor that diffuses behind it, inducing formation of double septa along the length of hypha. The cells disarticulate and function as propagules called arthroconidia (Figure 1.7). Arthroconidia are the simplest type of spores formed by hypha. How to observe fungal morphology in the petridish using light microscope.? How does pollen tube tip growth in plants?